Reasons for us to pick you: I always follow the rules, do my best to help everyone and can stand the stress that comes with the position. Extra info: I live in Colorado, have a good sense of humor and can take jokes. Why do you think you deserve Moderator Status: I deserve moderator status because i have always helped people on private servers even if i was just starting them myself.And i have shown dedication to this server and probably always will so long as it stays up and running. 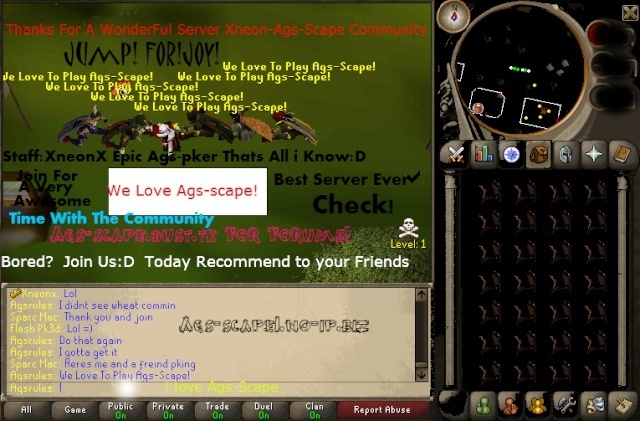 What will you do when you are mod: I will always do my best to help people when they need help and help keep the other players of AGS-SCAPE having lots of fun playing this amazing server. Have you ever been staff on other servers: I have never been staff because i didnt have the time to even if it had been offered. Will you advertise for the server: I will advertise the server as much as i possibly can because i can't wait for more people to be on it. Will you vote everyday: I will vote everyday I am on.